Facebook has changed the way we do business on the Internet. Many businesses are making their presence felt online – especially on Facebook which has recently topped more than 500 million users. Facebook lets you interact with your target audience – reaching out to them with your brand, products and services. From small businesses to enterprise-level organisations, Facebook has become the go-to social media site to engage with your market. We’ve recently launched a new service – Facebook Business Page Design – at Intertec. It began when we started our own Intertec Facebook Page – and it wasn’t long before our social media savvy customers started asking us to help them make their Facebook pages look smarter and more professional with our design services. If your business is on Facebook and you’ve been thinking about how you can make your brand more prominent on your Facebook business page, then get in touch. 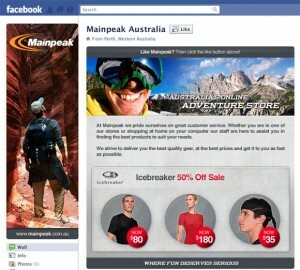 Our Facebook Business Page Designs start at $300 ex GST for a business profile image and Welcome tab.